In American City X, editor Mark Robbins, former dean of Syracuse University's School of Architecture, argues that innovative and compelling architecture can not only enhance the way a city is perceived, but also change the way it works. 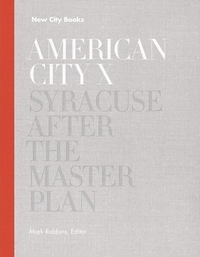 Looking to Syracuse, NY, as the archetypal "American City X," the book showcases projects that demonstrate potential positive futures for post industrial cities across the country. Featuring renovations and ground-up constructions ranging from landscapes to buildings and infrastructure at both residential and institutional scales, the successful recent work in Syracuse addresses sustainability, material and formal experimentation, and inventive use of space for evolving community needs."